I entered this card in the Cupcake Craft Challenge. The challenge was to make a 1 layer card. 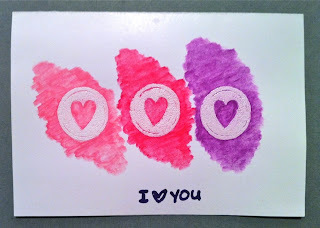 I embossed the circles in white and used Technique Tuesday Water color crayons to color over the heart circles. The sentiment is embossed in Purple Metallic Zing. Thanks for taking a look! Such a sweet card. Thanks for joining cupcake this week.